Add black eyed peas, tahini, garlic, parsley, paprika, lemon zest and juice, salt and pepper to a food processor and whirl to combine. Slowly drizzle in olive oil until creamy. Then add in water to desired consistency, remembering it will thicken in the refrigerator. Taste and adjust seasonings as needed. 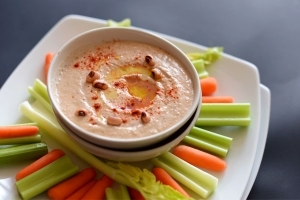 Serve in small dishes alongside veggies and pita chips and garnish with a drizzle of olive oil, sprinkle of paprika and a few black eyed peas. Just made this for a party I am attending tonight. It really is delicious.